Remember the happy feeling of going out to buy new school supplies when you were young? The feel of brand new markers and binders and folders and pencil boxes was so exhilarating for me. Plus, it was one aspect of school that we schooled children could control, one aspect that we could put a little personal flavor into. Now, as homeschool moms, some of us feel exhilarated with the grander scale of supply purchases we get to make for a brand new school year with our children, and some of us feel overwhelmed and anxious by it all……….most of us probably feel a bit of both. So I thought it would be fun to do a visual tour of what materials I have been gathering together this summer in order to make our 2013-2014 school year at Jesus Precious Little Lambs organized, prepared, and successful. Its a tour designed for all of you visual learners (school supply lovers and worriers too)! I am so pleased that my “Fabulous Fours and Fives!” curriculum post from last April has been a very popular read here for months now!! 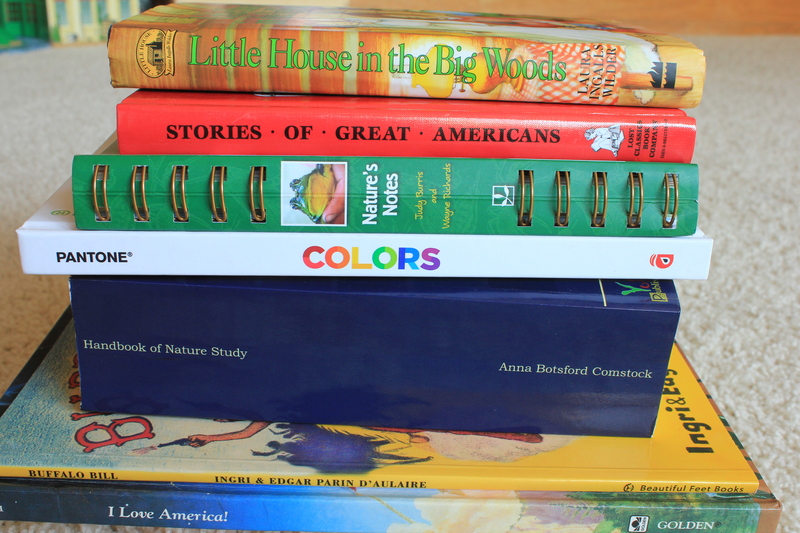 (I love looking at what other homeschoolers are doing for their 2013-1014 curriculum too!) This post is definitely like Part II of my “Fabulous Fours and Fives!” post. Let’s start with how we have been preparing for Pre-K math since it is one of the most supply intensive subjects. 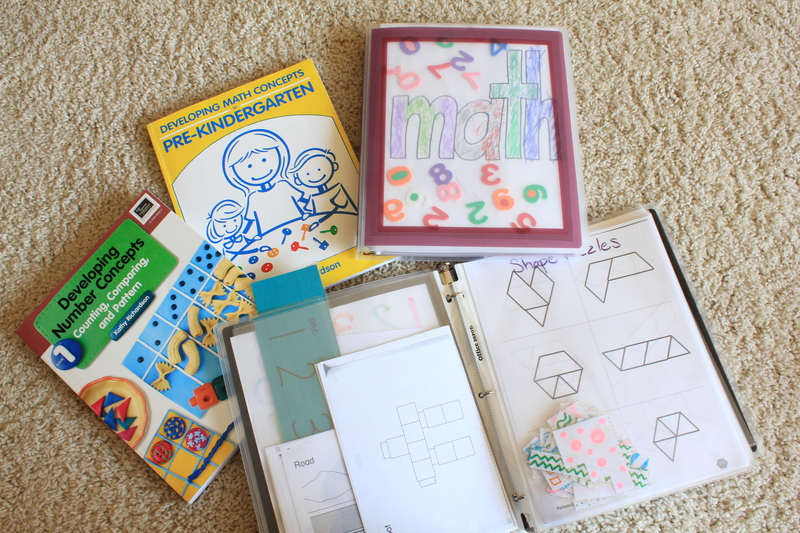 Much of the supplies, but not all, are used with and recommended in our math curriculum book. 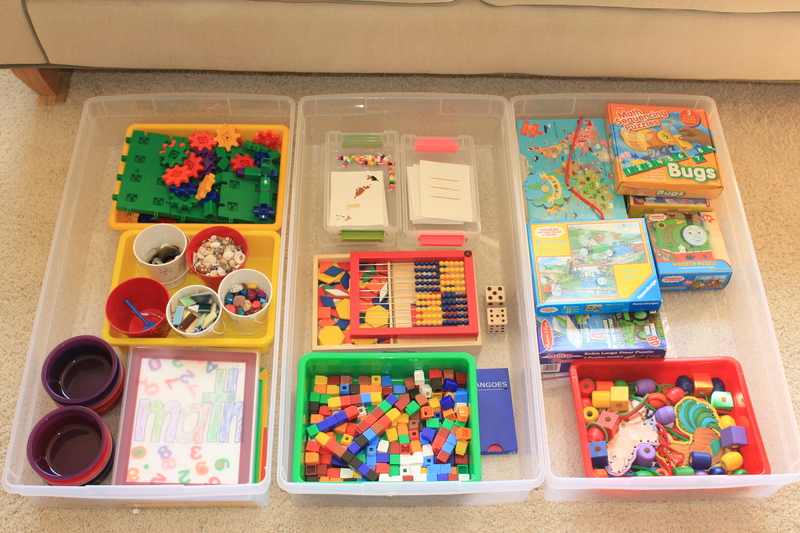 However, puzzles, gears, and lacing supplies are for example, my personal additions to the preschool “math department”. 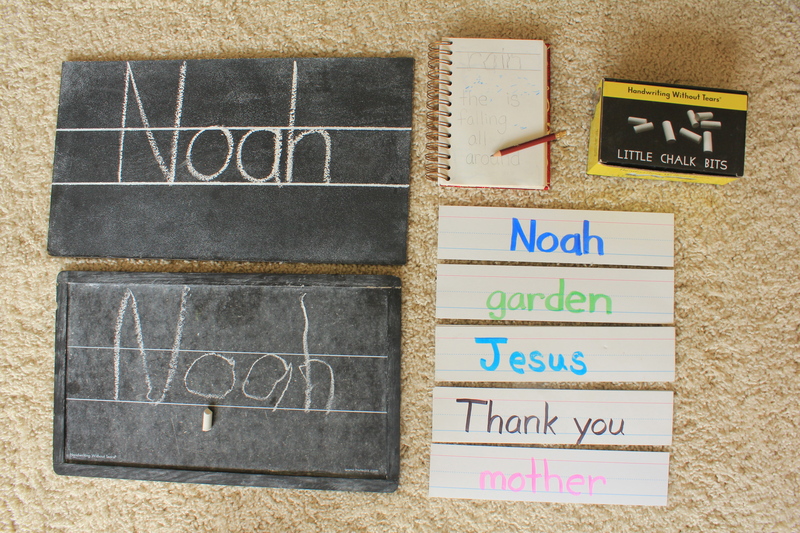 Most of these supplies have a range of uses making them perfect for 3, 4, & 5 year olds– preschool, and even beyond. Left bin: Gears, Gears, Gears; collections (for sorting and counters) of buttons, keys, mosaic tiles, shells, and gemstone rocks; bowls for counting, sorting, and other “hidden number” type activities; Noah’s math binder; geoboards and rubber bands (under binder). Middle Bin: Number set cards and beads on a string, Right Start abacus, Melissa and Doug pattern blocks and boards, unifix cubes, attribute blocks (under unifx cubes), Tangoes (tangram game). Right Bin: Puzzles, lacing cards, and lacing beads. Some of the supplies pictured above can be used in conjunction with blackline masters from our Kathy Richardson math curriculum books. To be more organized this school year, I made copies this summer of all the blackline masters from both the Pre-K and Kinder curriculum books and stored them inside of lots and lots of sheet protectors in “my math binder”. After covering a specific math activity this year in school, I will transfer the corresponding blackline master into “Noah’s math binder” (decorated by Noah and stored in his math bins) so that he can go back and re-explore the activity anytime he pulls out the math bins. We specifically set aside 1/2 an hour before school for Noah and Faith to pull the math bins out from under the couch and play with the math materials of their choice. I really love art so having a whole cupboard in the garage (since Noah was 1 year old) devoted to supplies was important to me. 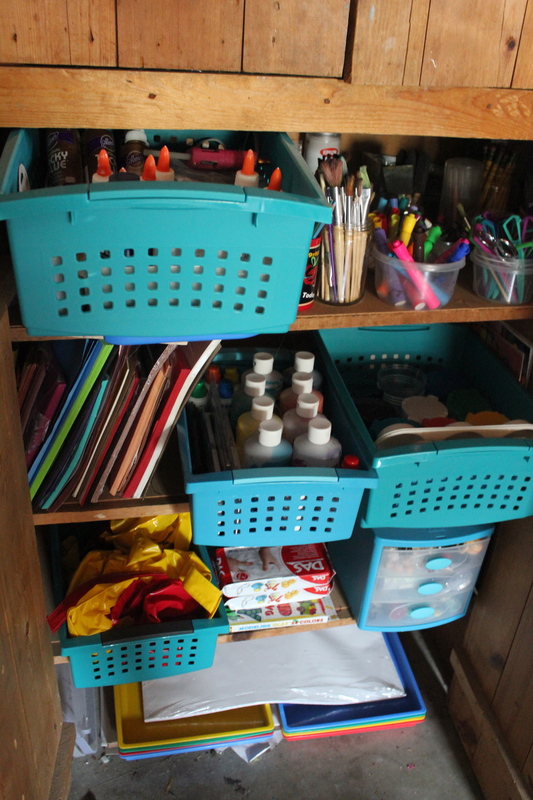 These are the things I like to have on hand: Elmer’s glue, tacky glue, Elmer’s glue sticks, hot glue, varnish spray (Krylon Clear Coat), scissors, markers, crayons, colored pencils, oil pastels, sulphite construction paper (finally organized with a pots and pans organizer from The Container Store! ), white sulphite drawing paper, watercolor paper, finger paint paper, finger paints, tempera paint, acrylic paint (used with supervision), watercolors, dot paints, no-spill paint cups, other various paint cups and trays, smocks, air dry clay, oven bake clay, never-dries modeling clay, smocks. Plus we have small drawers full of small stuff (like glitter and paper punchers). How often do we personally use typical preschool craft supply stuff like pom poms and pipe cleaners? Almost never. So we invest in mainly the basics–what I would call “real art” supplies that can be used over and over again in various ways. The Child’s Story Bible is our main Bible supply with a comprehensive collection of 200 Bible stories that can be read to children in about a 20 minute time period. Noah does devotions on his own some mornings before our collective Bible time. He needed a Bible with something to look at because my little sweetie would spend considerable time flipping through all the pictureless pages of The Child’s Story Bible as his way of “reading” the Bible. So I bought The Family Bible by Dorling Kindersley for $2 off Amazon since it is 400 pages full of detailed pictures for Noah to spend time looking over during his personal devotions. The realistic pictures really give him something to look at compared to all the cartoon illustrated children’s Bible we own. (A couple warnings: Some reviewers of this Bible felt that DK had a very secular/inaccurate viewpoint on the retelling of the Bible stories. We won’t be using the text portion of this Bible. Also, the pictures are way more graphic than your typical children’s Bible since it depicts battles and murders realistically.) The Preschoolers Bible is Faith’s personal Bible, but also provides Noah a chance to practice narration, and could possibly serve as a Bible for Noah to read to himself once he starts reading more. The Big Picture Timeline is really cool because its a timeline of all major Bible stories that can be colored. It shows kids, and clears up confusion for us adults too, about the order of when things happened throughout the Bible, and also provides some very general dates for events. Thru-the-Bible Coloring Pages was my idea for working a coloring time into our school day. It sounds funny, but I feel like Noah could benefit from more coloring since its a great way to develop fine motor skills (even if its not what I would call “real art”). And to make sure the experience is as beneficial as possible, mommy will be right there encouraging Noah, Tayler, and even Faith, to take their time, think about color choices to make it realistic, stay inside the lines, and color in certain directions when coloring spaces of certain shapes. So I think it will be quite unlike Sunday School or Children’s Church where kids spend two minutes pumping out a coloring sheet every week. Also, the coloring sheets will give our young ones hands something to do during a 20 minute read from The Children’s Story Bible, and something to remember the story by. 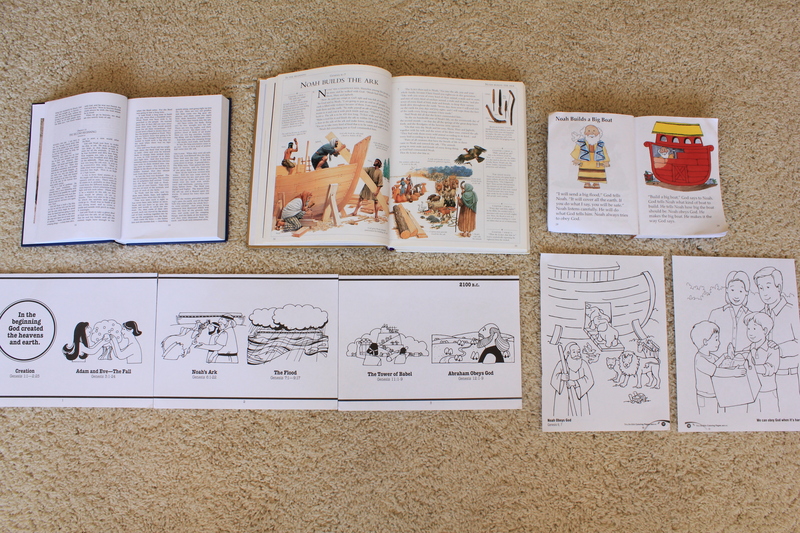 Here is a picture of the inside of each Bible resource to give you an idea. The great thing is that the timeline and coloring pages match up really nicely with the stories in The Children’s Bible Storybook. I am still working on putting the timeline and coloring sheets into binders for the kids, but that is the plan. Somehow I will be storing the timeline accordion folded in their binders so that it can be unfolded as one huge timeline, and reviewed anytime. As you can see, every Bible story coloring sheet has a corresponding “modern day life application” picture to color (like a picture of a boy giving away some toys to another boy which corresponds to the “we can obey God when its hard” theme of Noah’s Ark story). 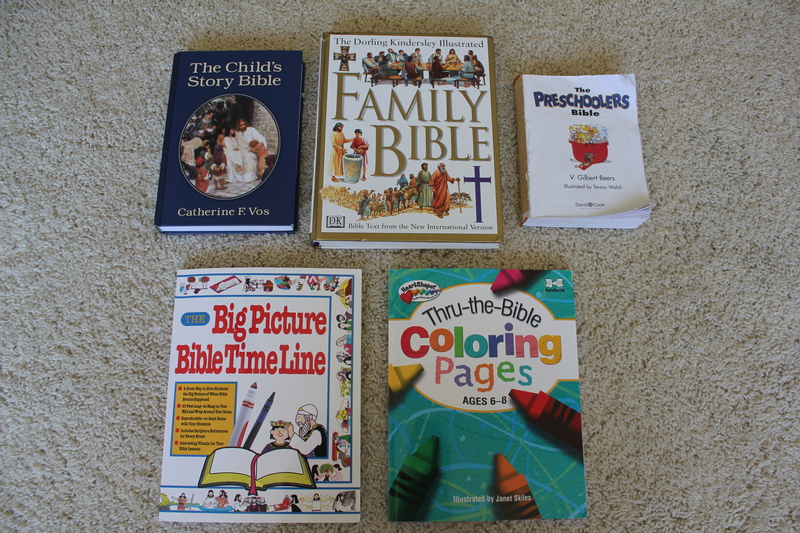 We will probably use our coloring binders to practice some handwriting by labeling pictures with the name of the Bible story character, writing one character trait the story taught, or a scripture reference that is meaningful, etc. I will also hand write word for word, the children’s cute budding attempts at narration during times that I ask them to tell the story back to me. The coloring binder will be like a special personal Bible journal of sorts, largely picture oriented since the children are so young. Pictured here is our hymnal from last year that we will keep adding songs to this year. 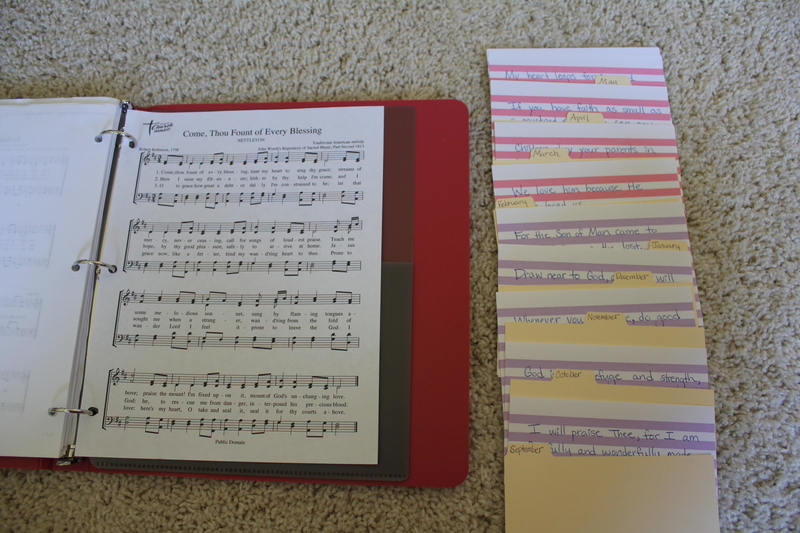 Also, our scripture memory system–memory verses from the last two years finally organized by month on index cards and soon to go into a personalized ‘Jesus’ Precious Lambs’ index card box (from Etsy). This way we can easily review previous year’s verses that we learned in the same month (since each month’s verses fit into a theme such as “joy” or “courage”). 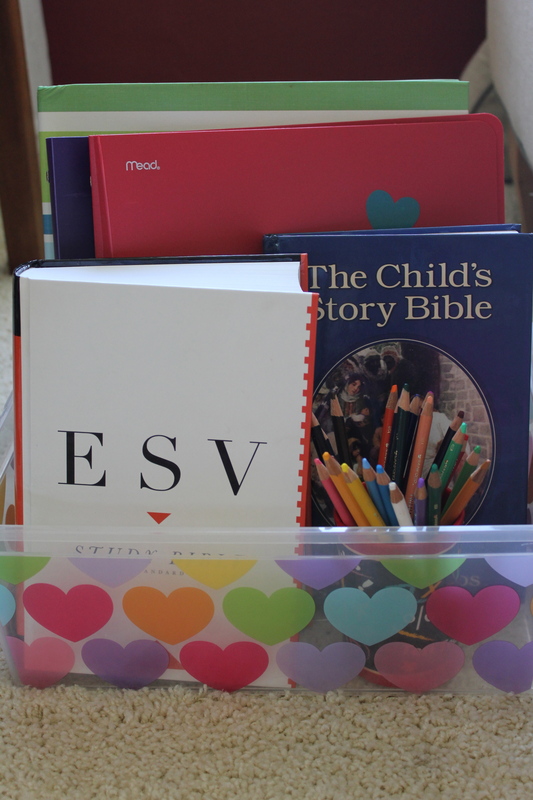 Our Circle Time box holds all of our Bible supplies–hymnals, Bibles, and coloring sheet/timeline binders. We spend about 30 to 40 minutes in Circle Time and it is primarily devoted to prayer, worship, and Bible reading. Our 3’s and 4’s pre-reading supplies consist of a Lauri alphabet puzzle and montessori sandpaper letters that both teach lower case letters (over 90% of reading requires familiarity with lower case so we don’t bother with upper case since toys and other resources always seem to teach upper case). The alphabet puzzle teaches lower case alphabet identification, and also touches on beginning word sounds (each letter has a picture of a word that starts with its sound underneath). We also used the puzzle a lot last year to do word building of simple three letter words. The sandpaper letters are for tracing with a finger and saying the letter sound (as tracing finger reaches the endpoint). Sandpaper letters teach directionality of letters which later supports handwriting lessons. We also use them like flashcards every once in awhile to test which letters still need to be reviewed. We have used them for different active “name that sound” phonics games that we made up, like racing across the room for sounds, and musical chairs with secret letters placed underneath. However, if I had to pick one supply over the other, the alphabet puzzle has been hands down the more useful learning tool for us (as you can see us using it across my blog). Our 4’s and 5’s reading curriculum for this fall is Delightful Reading by Simply Charlotte Mason. The curriculum uses rich reading selections such as “Rain” by Robert Louis Stevenson and a passage from Proverbs to teach the 100 most common sight words, plus hundreds more. Lesson #1, learning to read the poem’s first line, “The rain is falling all around”, we will cover in week #1. Each lesson consists of studying the words one at a time closely on the blackboard, identifying the words from a small pile of word tiles, then building each word with individual letters from memory if possible, and finally reading that selection “all by myself” in the Delightful Reader. 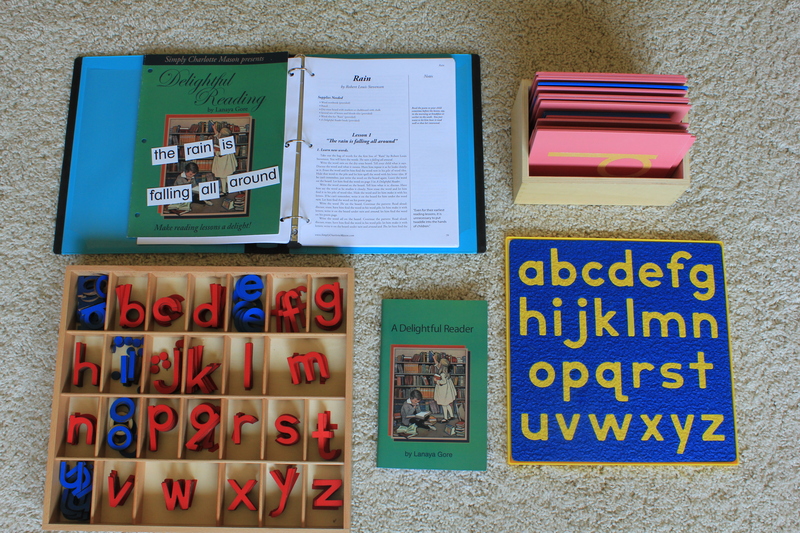 I purchased the montessori moveable alphabet, which comes with 5 of each consonant and 10 of each vowel, to do the word building portion of these lessons (rather than use the provided Delightful Reading letter tiles). Since word building was limited using the Lauri puzzle last year (but visually easy for beginners), I see the moveable alphabet as the next step for kids who are ready to move on from 3 letter phonetic words. Last school year, the focus was on building 3 letter phonetic words. This summer I introduced building 4 and 5 letter phonetic words with blends like -sh and -ch, as well as long vowel words with the silent “e” at the end. We are making good progress with phonics, and so this next school year, the reading curriculum will help us focus much more on building sight words (non-phonetic words that must be memorized such as “the”). Pictured here are words strip cards with words related to our theme of the month that our 3’s and 4’s learned to write last year– a total of 9 words, handy to hang onto for review. This year however, handwriting selections for our 4’s and 5’s derives from our Delightful Reading curriculum. We have spiral bound notebooks called “My Word Book” in which each child will record all the words he/she has learned to read. At the beginning of the year, I will record many of the words for them, as it would be too much work for them to do all the recording themselves. After doing reading lesson #1 on “The rain is falling all around”, I will do a quick handwriting lesson demonstrating how to write “rain” on my 2 line blackboard, and using chalk bits, the kids will write “rain” on their personal blackboards as precisely as possible, erasing as many times as needed until they are satisfied with their work. Then they will transfer “rain” into their Word Book practicing handwriting with paper and (golf size) pencils for the first time this year. Words that can be drawn, such as rain, will also be illustrated by the children. I may or may not have the kids trace the words that I record for them in their Word Book. Not a lot of supplies to buy for Literature since many books can be checked out from the library! We will be checking a lot of books out from the library, especially for History and Literature curriculum. However, the books pictured below are the ones I went ahead and purchased this summer for the upcoming school year. They are the ones from my 2013-2014 Curriculum plans that are not available at my local library (except for Little House in the Big Woods). I really enjoy having this book rack from Pottery Barn to store Bibles and library books so that they can be prominently displayed and promptly selected. During the school year, we have used this book rack to display library books that match our month by month school themes. I must say though that letting the kids pick out their own topics of interest from the library this summer has really put extra enthusiasm and ownership into them for reading materials. Here you can see pictured what type of things my little boy Noah is drawn to, and the books that my little girl Faith selected herself on the bottom shelf. We may need to continue letting the kids make a lot of their own selections from the library during the school year too instead of sticking only to themed literature. 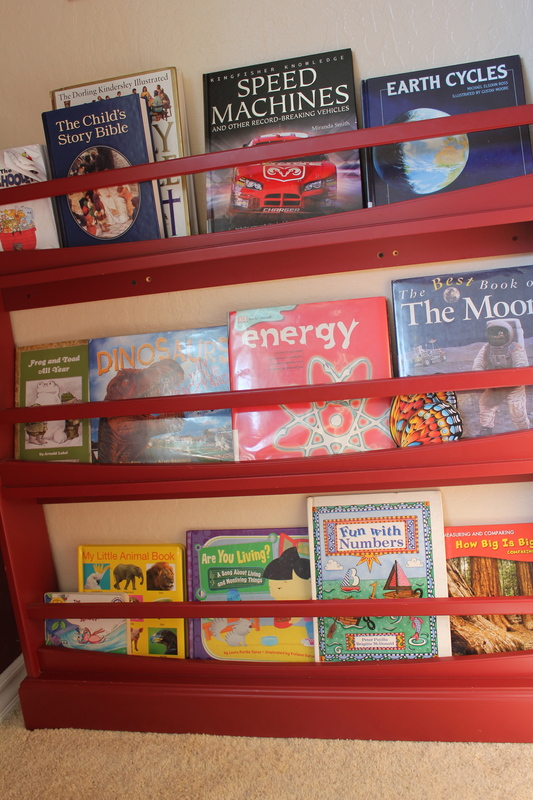 We also have a cupboard full of books of all topics that we own right next to this book rack. From these two areas, our kids select their own reading materials for free reading times, which we have built into our schedule each day. I love Greenroom binders from Target, and they are where we store the year’s work. All of our school projects are thoughtfully planned and meaningful, so we don’t trash much of anything. 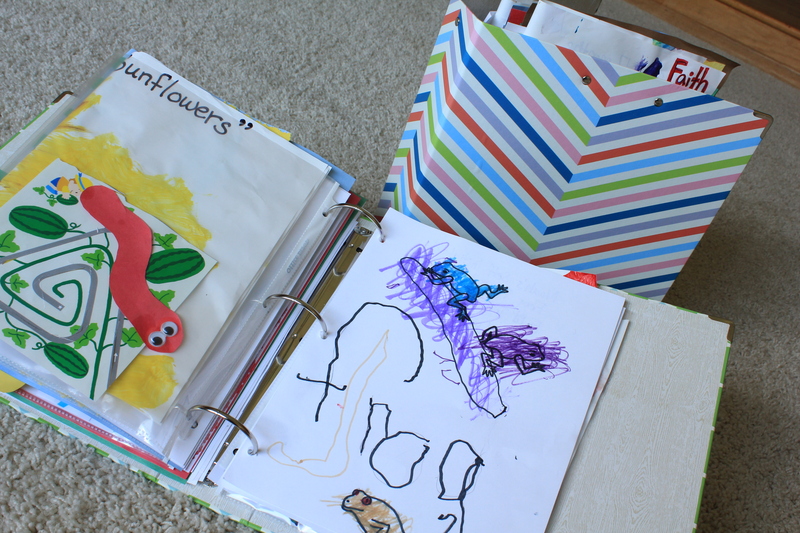 Our preschool portfolio binders are full of such delightful memories, consisting mostly of artwork, and eventually our portfolios will evolve into much more with samples from all subject areas. Wow, thank you! I appreciate the encouragement. Yes, I will call you! !